Published: July 3, 2011 at 08:08 p.m. 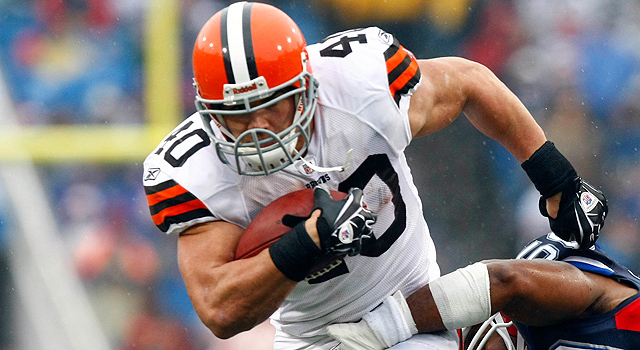 The fans recognized Peyton Hillis' greatness last season. The players? Not so much. Let me put "The Top 100 Players of 2011" into perspective for you: The NFL fans voted for Peyton Hillis to be on the cover of "Madden NFL 12." The NFL players didn't even have him on the list. "The Top 100" also should have put the notion of the players voting on the Pro Football Hall of Fame to rest for good. The players just don't know what they are doing. Dave Dameshek and I covered many of these gripes during our weekly Sunday "Top 100" podcast, but here are my top six complaints. Hopefully they will have me running this thing next year. This was a terrible way to kick off the series and showed why nobody should take this thing seriously. Immediately, we didn't know if this list was based on last season, career achievements or where the players currently rank going forward. In any event, McNabb misses on all three categories. Listening to NFL players rave about offensive linemen is akin to hanging with some hipster drinking Pabst Blue Ribbon tall boys and raving about The Hold Steady. We get it, you are plugged in. But honestly, any player who thinks that a guard is more valuable than Eli Manning -- who didn't make the list -- is fooling themselves (see, I've got some love for the Mannings). Are there four receivers in the league better than Jennings, let alone 14? The Packers did have the most players on the list (thankfully), but some of them were far too low. Miles Austin, Marques Colston and Devin Hester (No. 32) were all listed higher. I sometimes wonder if the players even watch NFL football. How is this even possible? The NFL has evolved into a passing league, yet a fullback is listed at No. 65. Ahead of Jennings. Ahead of Joe Flacco. Yes, somebody call up the Ravens right now and see if they would take Vonta Leach over Flacco. I would do it just to hear Ozzie Newsome's belly laugh. This is yet another example of the players trying to top shelf us with a "smart" pick. One problem with this type of list is that it runs quarterback heavy. There is no way to avoid it. Quarterback is the most important position in the NFL. And you mean to tell me that two of the top five passers in the NFL don't even crack this list's top 20? I really hope I am on the committee to revamp this show next year. They really need me. Having the Super Bowl MVP and the guy widely considered the best player in the game outside of the top 10 is completely inexcusable. Find me one person outside of the Manning family who would rather have Peyton over Rodgers, and I will find you a person who spends way too much time playing Halo and not enough time watching the NFL. You can't even make a reasonable argument for Rodgers to be excluded from the top 10. Heck, even the top five. "Pick Six: Better Hall presenters for Faulk..."